The American Prairie Reserve has reviewed the BLM scoping report & are pleased w/ the level of engagement & support that have come from all corners of #Montana. 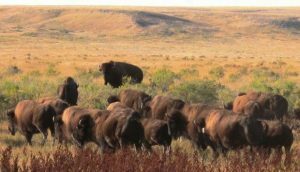 This includes the Fort Belknap Indian community, hunting and public access groups, wildlife scientists, former land and wildlife managers, and private property advocates. The BLM has done a good job narrowing the scope of issues to adequately analyze the public benefit associated with this proposal and the well-documented science this application rests on. We look forward to continuing this discussion with BLM & local communities in a neighborly fashion as the process moves forward.